There are lots of granite colors which are most preferred to the homeowners. Now gold granite has a great trend. And Vyara gold granite is one of them. Vyara gold granite is a striking blend of Ivory and Gold shade. And there are brown spots on the on pale, ivory background. This particular granite is known as Indian Beige Vyara Granite. These granites are available in Antique, Polished, Honed and Flamed in finishing. And these granites are use in various interior purposes like flooring, wall-cladding, countertops etc. Lots of people use the Vyara gold granite in making floors of their offices or homes. Because, this particular granite offers an authentic look to your space. In addition to, its durability, low continuance profile, recyclability and timeless artistic appearance make it a sustainable floor covering option. The color of the granite may be dull due to foot dust. However, granite floors have to to be vacuumed on a regular basis to take away the abrasive things which may cause dulling the granite surface. The architects also recommend the Vyara gold granite for the wall cladding in your home décor. The unique character, texture, aesthetic appeal, royal color are responsible for it. Granite is one of the most durable normal stone facades. And it the perfect choice for kitchen and bath. 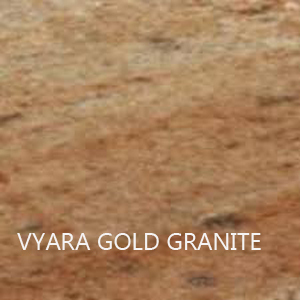 Vyara gold granite countertops offer the uncompromising beauty and elegance and it is easy to clean. Many people all over the world use these granite countertops in their kitchen, bathroom and mantelpiece. And the polished surface of this granite gives a modern and shiny look for homes and buildings. Each and every granites need care and upholding. Light shaded granites are porous than deep shaded granites. And Vyara gold granite is a light shaded granite. You can check the porosity of granite by taking the lemon juice test. Take a slice of granite as sample for test and fall a little drop of lemon juice on the granite surface. If you notice that dark spots are rising under the drops of lemon juice over the granite surface, it proves that this granite is vey porous and requires deeply sealed. If it takes a minute for creating the marks then it is easily controllable by using of an excellent impregnator- kind sealer like. If it does not soak up at all, then it proves that it is one of the best quality granite and requires just a light seal which is necessary for granite as it is a natural stone. Why do you take lemon juice for test? Because lemon juice is very much acidic and by any chance, the granite you have taken for testing, is mixed granite or with some calcite in it, it would marked without any kind of sealer. Because, acid crashes the sealer. So, it is advised that deep clean and reseal once in a year are must for your granite. Your care and concern will help to keep well the Vyara gold granite and it will enhance your home for years.